Average of maximum temperatures (Tmax) across 22 weather stations all over UK. Tcalc is the calculated temperatures based only on cloud forcing, ignoring all CO2 forcing. See description of the model given in the text. In June I received an email from Euan Mearns concerning UK temperature data and their interpretation. The historic data from 22 stations are available from the Met Office http://www.metoffice.gov.uk/climate/uk/stationdata/ He had noticed a striking correlation between monthly Hours of Sunshine and the Maximum Temperatures after about 1956. He interpreted hours of sunshine as being a proxy for cloud cover. His hypothesis was that perhaps average monthly cloud cover determined the maximum recorded temperature. He asked me for help to develop a simple radiative forcing model to explain the data and we started a collaboration. This started nearly a 3 month study of cloud forcing compared to CO2 forcing. The previous two posts describe the annual average temperatures compared to a combined cloud & CO2 forcing model. The results show a modest CO2 effect and a strong cloud effect on UK annual temperatures. One criticism of the cloud forcing is that clouds behave differently with season. So in summer cloud cover is more likely to have a net warming effect whereas in winter clouds may have a net warming effect as daylight hours reduce. For this reason we looked at summer months only – June July & August to compare with the model on a yearly basis. This is more complex as for each station we need to calculate summer daylight hours and the incident insolation as these vary with latitude. 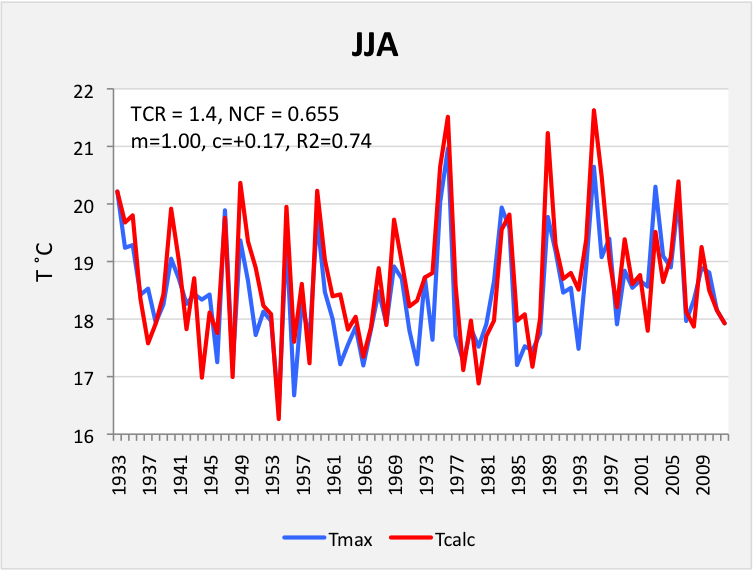 For each station we then calculated the forcing due to the measured values of CO2 and Clouds averaged over the 3 months JJA for each year using the model described previously. The calculation was started in 1930 and done indpendently for each station. 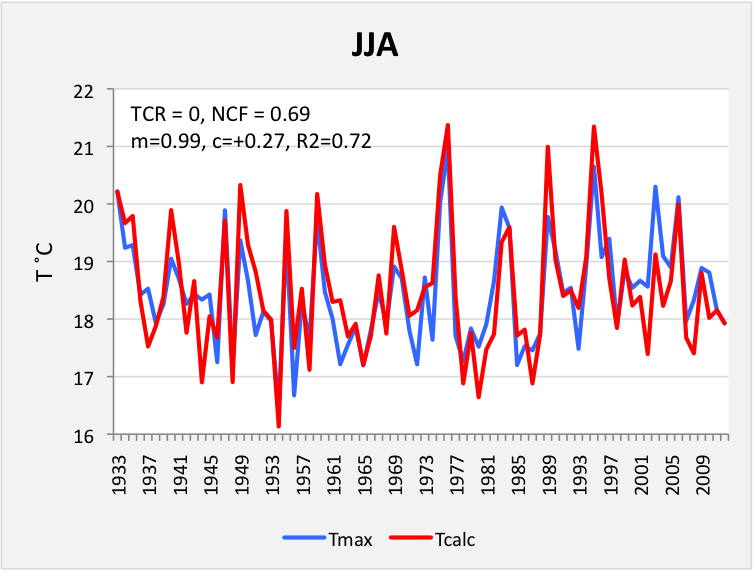 Tcalc was normalised to the individual 1930 temperature and then for each successive year Tcalc(y) was simply set to Tcalc(y-1) + DT. The average value of Tcalc over all stations was then compared to the average Tmax over all measured values. Variations in cloud cover explains all the yearly variations in summer temperatures. Including a CO2 term gives a reasonable fit based on R2 using NCF=0.69 (Net Cloud Forcing) and TCR = 1.4C – see Figure 1. Fig 1: Comparison of calculated temperatures to measured temperatures for 22 stations across UK. 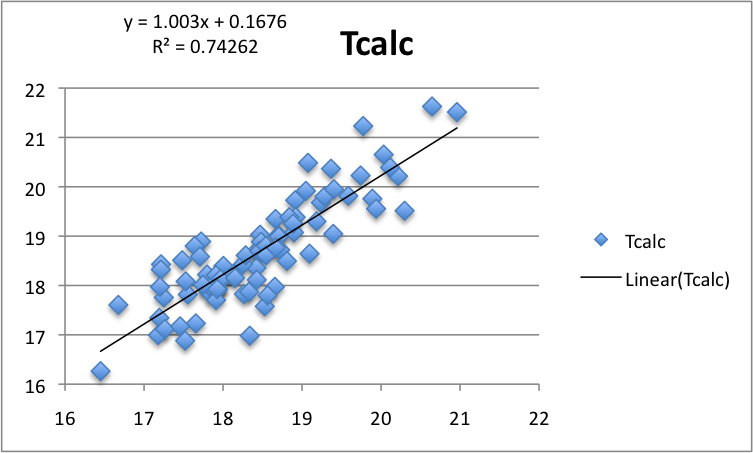 Fig3: Correlation plot of Tcalc versus Tmes. y=x is a perfect fit. The fit is remarkably good. The clean air act was introduced in 1956 which helped reduce smoke across the UK and the correlation of the annual temperatures was not good before 1956. However the summer months were free of such problems because there were no open fires in towns so the correlation between sunshine hours (cloudiness) and temperatures is clear throughout the time series. Is there any strong evidence for AGW in this data ? To check this I set TCR=0 and got the following result using cloud forcing only and NCF=0.69. Fig 2: Comparison to cloud forcing only by setting CS=0 – i.e. ignoring CO2 forcing. The fit is also very good which shows just how unimportant AGW has been for UK summers so far. The most important factor governing climate in the UK is changes in cloud cover – or seasonal weather. We kind of knew that already ! Another interesting observation is that good summers tend to come in runs 2 or 3 successive years. So as far as the UK summer temperatures are concerned global warming is pretty much a non-issue thus far. Yearly variations are still much greater. So if we have a warm summer in 2014 no doubt the BBC will tell us global warming is to blame – but it won’t really be true. It will have been because we have had less cloud than normal. 1976 was the hottest summer experienced in the UK since 1933. I got married in 1976 in Wales and it actually rained that afternoon for the first time in over 2 months ! This entry was posted in AGW, Climate Change, climate science, Institiutions, Science, UK Met Office and tagged Climate Change, Climate Sensitivity, Clouds, CO2. Bookmark the permalink. Note: I will be on a train across central Australia for the next 2-3 days so I won’t be able to reply to any comments till tuesday. See comments I’ve left on Euan’s about OLS on scatter plots. Your slope is a bit low to judge by eye, that probably accounts for non zero intercept. The proper way to do it is to calculate Chi-squared between the model and data with errors included. Indeed, the only way to get a more accurate estimation of the real relationship is to have additional information about the magnitude of the errors in each variable. In this context “errors” include confounding factors such as some real physical variation that is not part of the relationship you are trying to fit with the linear model. However, knowledge about errors is easier siad than done. A phase shift will mess things up nicely too. My previous post contained losts of graph links so I don’t know whether I’ve tripped some kind of spam trap or if there is a more general problem with Euan’s site. I guess you can check and alert him by other means if it’s down. Daily data for Durham and Oxford are unfortunately not freely available from the Met Office website. Some data may be provided free of charge for academic enquiries – the contact for this would by Barry Hall in the Central Climate Unit. However, there are limits to the volume of data which may be provided freely and there may well still be a handling charge. Another option for obtaining data are through the BADC website here: http://badc.nerc.ac.uk/home/index.html. This is for UK academic users, who would still have to register and need some knowledge of the structure of the Midas database. Another option for these particular stations is to look at the websites run by the observatories. It may be possible to contact them directly to request data. It’s hard to see why this publicly funded research data is not openly available but it seems it may be possible to acquire some detailed data to better investigate the relationships and especially the presence or absence of a significant lunar effect. Just check out the positions of Jupiter and Saturn in relation to Earth in each of these extreme weather years. Look further back too.